Blood clotting and haemostasis are regarded as synonyms. As a rule, blood coagulation is the term we employ when trying to clarify research for the benefit of those we wish to inform (members of a funding body, for example) whereas haemostasis has a crisper and more academic sense, and would be better for writing a paper, or trying to repel an over-inquisitive manager, who won't be able to grasp what it means. However, the terms are not synonymous. Blood coagulation describes the structural change in blood from a slightly viscous liquid, to a gel held together by a network of platelets and fibrin threads. Haemostasis defines the process by which blood flow is arrested, which is not the same thing. The traditional description - of blood flowing from a ruptured vessel brought to rest by the formation of a plug of erythrocytes, platelets and fibrin - cannot function in practice. The stimulus for the precipitation of the biochemical cascade that ends in the precipitation of fibrin is the release of factors released by the damaged blood vessel tissues. Consider how it operates: once the precipitation of fibrin has commenced, the blood is already well downstream of the trauma. The model will allow for the formation of a fringe of fibrinous threads, complete with adherent platelets, that flows downstream, away from the site of injury; but it does not allow for the formation of a plug. The problem is well documented by the standard accounts that abound in the literature. On the world-wide web we can find a good video-micrograph sequence of thrombus formation in vivo; and here we can clearly see how the thrombus develops down-stream of the lesion which triggers its formation . Within a blood-vessel, this will clearly cause haemostasis. But in an open wound, this time delay will prevent the formation of a clot at the site of haemorrhage. The same web site publishes a series of diagrams of the process, which clearly illustrate the nature of the conceptual problem. The sequence shows a traumatised blood-vessel wall, the erythrocytes issuing from the vessel to the void, platelets as they accumulate at the site, and fibrin threads that are precipitated as a network. It is noteworthy that, in these images, we see only the blood-vessel's eye view of the wound - we see the region in which the blood is haemorrhaging from the vessel. The other end of the trauma is not portrayed. We do not see the blood once it has left the body - yet it is here that the haemostatic mechanisms are initiated. It seemed clear to me as a young laboratory scientist with the Medical Research Council that there must be a mechanism that related the down-stream precipitation of fibrin back to the site of the trauma, which initiates the process. Part of my work with Professor Scott Thompson involved studies of the antibodies in calves' blood and I took to examining drops of freshly-shed blood under the optical microscope. Whole blood has too great a cell density for clear observations, and it transpired that dilution with plasma was necessary to dilute the concentration the erythrocytes. Physiological saline proved to be an acceptable alternative, and very small droplets of the diluted blood were placed under the centre of a coverslip. The first observations revealed that erythrocytes seemed to be arrested with the coagulating blood. 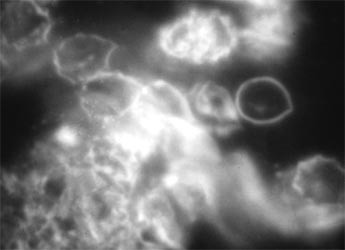 The cells were clearly caught in the manner of a balloon on a string (Fig 1). They could be seen to be jostled by passing cells and cell aggregates, subscribing an arc that led one to infer that they were held on a submicroscopic fibril. Pressure on the coverslip could be employed to increase the rate of centripetal flow beneath the coverslip as the droplet spread through capillarity, and the position of the cell was related to the rate of fluid flow. Here was evidence that the cells are held, not merely on a submicroscopic fibril, but on one that was has elastic properties. 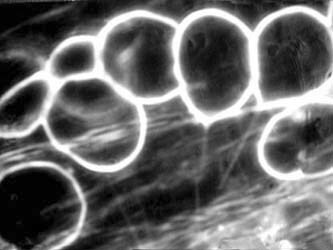 The experiments were filmed and the results presented at a meeting of the British Microcirculation Society held at the Royal Society, London, in 1965 . The preliminary results were later published  and attracted considerable attention. A refinement of the technique led towards the timing of period during which the diluted blood rested on the slide, prior to the application of a coverslip. This gave an important benefit, for it led to the formation of a fringe of coagulated blood forming at the periphery of the droplet. When the coverslip was added, the pressure on the droplet (plus the capillarity exerted between the slide and the coverslip) led to the liquid blood at the centre slowly finding its way through the coagulum that surrounded it (Fig 2). Fig 3: The brightness of threads is proportional to their width. The micrographs were greeted with considerable enthusiasm by the clinicians' newspaper Medical News which presented the micrograph on the front page, following it with an extensive feature on the inside pages . There were even reports in the popular press  which were syndicated and reprinted throughout the British press. The micrograph was later published in the United States as a 'scientific highlight', appearing opposite a photograph sent back from the surface of the moon . There were further reports in the press; clearly, the observations were attracting widespread attention. Further research led to the development of a provisional 'penderocyte test'. Conventional tests of coagulation focus on the components of the clotting blood. A recent example has been described in these columns by Dr P Giesen . The test developed in 1967 involved taking a series of diluted blood droplets and timing the intervals at which a coverslip was added to each slide in turn. The presence of penderocytes gave a measure of the clotting time of the blood  - not merely the times at which specific serum components were demonstrated, but when the blood was actually capable of haemostasis . With the assistance of my colleague Dr W. S. Ng, cardiac anaethetist at Cardiff University Medical School, some preliminary trials were carried out during open-heart surgery on patients of Dr Tom Rosser, cardiothoracic surgeon at Sully Hospital, South Glamorgan. Patients subjected to prolonged perfusion on the bypass pump tended to suffer a disorder of haemostasis. The resulting leakage into the pericardial sac is the cause of cardiac tamponade, well known to surgeons. Often the conventional blood tests suggested that clotting was within normal limits; however, the penderocyte test could sometimes predict that a patient was specifically at risk of haemostatic failure and consequent tamponade. The preliminary tests showed some good correlation. 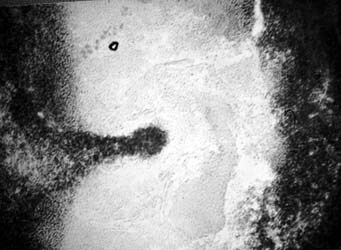 The theoretical explanation was that the tumbling of erythrocytes across the circulating plates of a perfusion pump caused a surface trauma which led to a failure of the formation of the fibrinous microfibrils, or which led to a failure of the threads to become attached to the cell surface. We observed the suggestion of a correlation between the length of time a patient was on bypass, and the time it took for penderocytes to appear. There were no facilities to launch a major research project, and the matter has not since been progressed. Research has considered the rheology of coagulating blood  and has examined the physical constraints that apply to the changes of viscosity as haemostasis occurs, but which do not bring the crucial changes at a cellular level into the equation. Other studies include the use of ultrasound to monitor the extent of thrombus formation in vivo, and here we have the basis for some clinically useful data that can be of use in establishing a prognosis and in monitoring patient progress . Yet the work has not been forgotten; internet searches in the area of haemostasis prioritise the web sites which document this early research. Because Olympus microscopes and cameras have been used extensively in this work, the original micrographs were recently reprinted in an Olympus magazine  and have attracted renewed interest. It is hoped that the concepts might yet attract the interest of a contemporary research haematologist, since the penderocyte seems to have a role that seems to be of demonstrable significance in the understanding and prediction of successful haemostasis. Ford, BJ, 1965, The Role of the Erythrocyte in Coagulation and Hæmostasis, paper to Microcirculation Society conference at the Royal Society, Burlington House, London, 3 February. (see also: Penderocytes in Human Blood Coagulation, Journal of the Royal Microscopical Society, February 1965). Ford, BJ, 1965, New Observations on the Role of the Erythrocyte in Coagulation, Journal of the Royal Microscopical Society, 84 (4): 423-426, October. Report and Picture, 1966, Meet the Penderocyte, a new discovery [front page story with photographs], Medical News, 178: 1, [and] The Penderocyte Revealed [with pictures], ibid: 13-15, 4 March. Dover, Clare, 1966, Sensational Blood Discovery, London Evening Standard, 28 March. Report and Picture, 1968, Scientific Highlights of the Year [photomicrograph of penderocytes in hæmostasis] International Year-book of Science and Technology: 90, New York: McGraw Hill. Giesen, P., 2005, A calibrated automated tool to assess the thrombotic-haemostatic system, Clinical Laboratory International 29 (3): 20-22. May. Ford, BJ, 1972, A New Single-Drop Technique for the Observation of Dynamic Blood Coagulation, Journal of Microscopy 95 (3): 507-510, June. Kaibara M., 1996, Rheology of blood coagulation, Biorheology 33 (2):101-7. Chih-Chung Huang, Shyh-Hau Wang and Po-Hsiang Tsui, 2005, In Vitro Study on Assessment of Blood Coagulation and Clot Formation Using Doppler Ultrasound, Japanese Journal of Applied Physics 44 (12): 8727-8732. Ford, BJ, 2006, Mysteries of the blood clot, Olympus Illumin8 magazine: 3, February.